Departure time: 8.30 am Sundays and Thursdays (October – March). 2.30 pm Sundays. Tuesdays and Thursdays (April to September). We are comparing Tivoli Half-Day Tour with a Visit to Villa d'Este and Hadrian's Villa Prices from leading ticket suppliers and Try to find you Cheap tickets prices on the market. Leave behind the busy streets of central Rome. Board a comfortable air-conditioned coach and travel into the charming Campagna countryside. You'll follow the Via Tiburtina through lush hills to the ancient village of Tivoli. Enjoy scenic views along the way and enjoy the commentary of your multilingual guide. During the drive your onboard guide will introduce you to the region and point out all the sights of interest. learn about the history of Campagna from the times of the Roman Empire to the present day and feel free to ask any questions. On arrival to Tivoli you'll be led through ruins dating back to the 2nd century. The Villa Adriana (Hadrian's Villa) hosts the remains of palaces, theatres, temples and, of course, the famous Roman baths. Next, you'll visit the picturesque Villa d'Este, built during the Renaissance era for the Governor of Tivoli. You'll be guided through this grand estate and into the lavish gardens and terraces, hosting ornate mosaics and fountains designed by Bernini. After visiting both villa's you will return by coach to Central Rome. This tour is ideal for people who would like to travel outside of the city without the stress of taking public transport or the expense of private transport. Suitable for solo travellers, couples or small groups. Recommended for visitors of all ages. 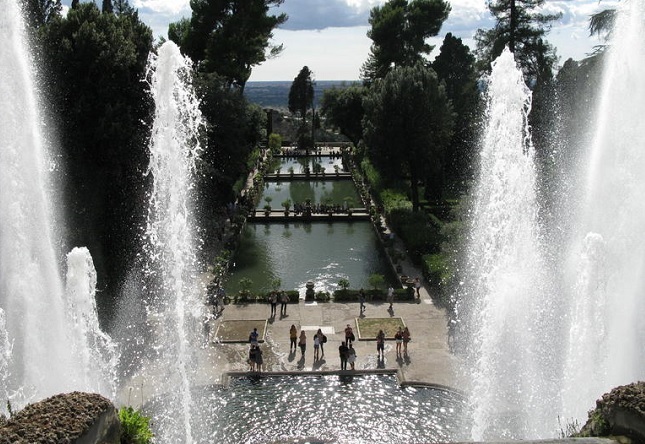 Your Experience With Tivoli Half-Day Tour with a Visit to Villa d'Este and Hadrian's Villa? Visit 2 of Italy's UNESCO World Heritage sites on a half-day tour from Rome. Escape the crowded city centre and travel by air-conditioned coach to the village of Tivoli. See the beautiful Villa d'Este and the tour the remains of Hadrian's Villa. Explore the ruins of Roman baths, stroll through magnificent fountains in the gardens of Villa d'Este. Learn a some of the long history behind both of these historical sites from a knowledgeable tour guide. Travel stress-free with all transport and entrance tickets arranged for you. What Tivoli Half-Day Tour with a Visit to Villa d'Este and Hadrian's Villa Includes? Entrance to Hadrian's Villa and Villa d'Este. Round trip transportation by coach from Central Rome. Hotel pick-up/drop-off (from central hotels only). Pick-up from Rome – drive to Tivoli – visit Hadrian's Villa – travel to Villa d'este – return to central Rome. This tour may be cancelled or rescheduled if there are not enough participants. If visiting during the wintertime consider booking at the begging of your trip and leaving another day free just in case. Travelers Reviews about Tivoli Half-Day Tour with a Visit to Villa d'Este and Hadrian's Villa? This tour has been given 4.2 out of 5-stars from Get Your Guide users and an overall score of 4.5 from Trip Advisor. Travellers say that this is a very pleasant day tour, well organised and with informative guides. There some complaints that there is only a limited time at each villa but most agree that there is still enough time to enjoy the sites. Tickets are refundable but depending on tour provider cancellations fees may be applied. Tickets are accepted in print or mobile form. This tour may be conducted in more than one language. Wheelchair users should be accompanied by an assistant. Meeting Point: Near Roma Termini, or pick up from hotel.